Android is undoubtedly one of the best operating system in this current World. Android has so many awesome apps available for our day to day use, and to also make our android experience simple and interesting, all credits go to it's innovative developers. 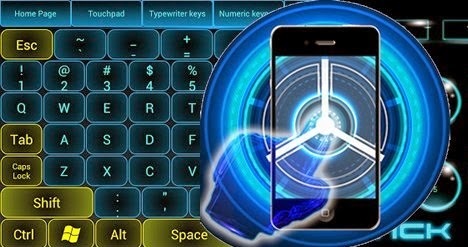 There is another great android application out there that allows you to use your Android device as a mouse or a keyboard.So if suddenly your mouse or keyboard stops working then you can use your android device at that time if you are out of time.So isn't great?Yes we too believe that.So here today in this article we are going to share that awesome apps with you along with it's installation and use process.So let's go through the below article to check this out. In this article you will find out the easiest way to use your android device as a wireless mouse. The simple application you need to use is named REMOTE DROID. We guess Many of you may don’t know that how to use android devices as wireless so that now here we're going to share with you the tricks to on how to use this android apps as wireless mouse. At first you need to have already set up a wireless home network. You will also need a Java SE runtime environment 1.5 or more higher. Here are the full settings of Android Devices As Wireless Mouse. Next you need to run the file as a remote server jar. Now note down the IP address of the remote server displayed in the window you just opened. Remember to note it down cause you will still need it in setting up your wireless android mouse else it won't gonna work. Here are the full setting steps of Android Devices As Wireless Keyboard. There just search for remote droid app,first download and then install it. That's it .There a large square button will pop up on your android screen. that is the mouse capture, the left green box you see functions as the left button mouse, right green box functions as the right button mouse, and the keyboard icon between the boxes brings up the keyboard input window to allow you to type on your PC. So isn't it pretty cool and simple as well?What do you think?Have you used it before?Do let us know through your comments.If you are facing any problem regarding this do let us know through the comments.Hope you liked our tutorial.Keep visiting for more such awesome tutorials.